Ebola! The facts and fiction. When I was seven years old I watched a movie called Outbreak; an action packed movie that threw together Dustin Hoffman, Morgan Freeman and a cute monkey battling a mutating virus that began to overwhelm a small town. This movie led me on a an exploratory journey into the world of infectious diseases. Outbreak was loosely based on the book the Hot Zone, a nonfiction novel about the history of hemorrhagic fevers. I read this book over and over, and to this day still have the the same weather worn copy. With the recent International outbreak of Ebola, I thought it would be a good idea to spread some wisdom about Ebola. *Human Liver infected with Ebola. Transmission: Spread of bodily fluids or objects recently in contact with bodily fluids. Air transmission has not been seen in any form of transmission. Can spread through blood, vomit, mucus, and feces. Pathogenic organism: Four Ebola virus strains are know to cause disease in humans: Zaire (EBOV) which now just known as Ebola Virus due it it being the most common virus, Bundibugyo (BDBV), Sudan (SUDV), and Taï Forest (TAFV). The fifth strain is not known to cause disease in humans and is named Reston (RESTV). The first Ebola outbreak in history was in 1979 where two outbreaks occurred at the same time: one in Nzara, Sudan, and the other in Yambuku, Democratic Republic of Congo. 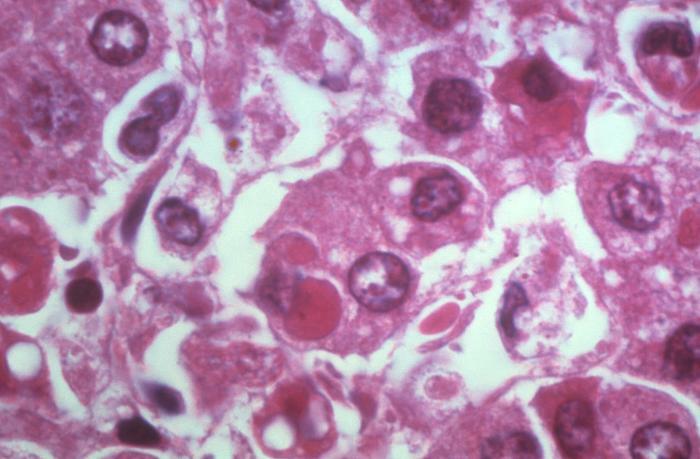 The virus was named after the Ebola River in the Democratic Republic of Congo, then named Zaire which is the name of the most common form of the virus. The natural reservoir of the disease is thought to be a kind of bat from the family of Pteropodidae. The disease has an incubation period of 2-21 days in which a person is infected and can infect others. Being symptomatic means a person is infectious. Symptoms include those similar to many other viruses such as: fever, sore throat, muscle pain and vomiting. Ebola typically has a case fatality rate of around 50% but can range from 25-90% depending on available healthcare, comorbidities and healthcare infrastructure. The recent outbreak in Africa caused widespread panic across the world. Countries from all over the world sent healthcare aid, workers and supplies. Unfortunately, health care workers are at an increase risk of infection due to close contact with patients and their samples. As we’ve seen with the recent Ebola outbreak in Sierra Leone, Liberia and Guinea, the risk of health care workers being infected and travelling outside of the infection zone is a safety concern in any kind of outbreak. The key to controlling any outbreak is containment and healthcare mobilization. If there are any questions you would like me to answer, comment below and I will happily answer! * The information and pictures from this posted is references from the Center for Disease Control and Prevention Ebola Page on http://www.cdc.gov/vhf/ebola/ and on the World Health Organization on http://www.who.int/mediacentre/factsheets/fs103/en/ -Please visit these sites for more information!